Quick Start Cursive/The Art of Cursive . . . My Review | My Journeys Through Life . . . Herding Cats In New Mexico! My son “The Puzzler” has been really wanting to learn cursive. He is age 16, with cognitive disabilities. The CursiveLogic Quick Start Pack turned out to be a good fit for him, in spite of his initial resistance to the method used. 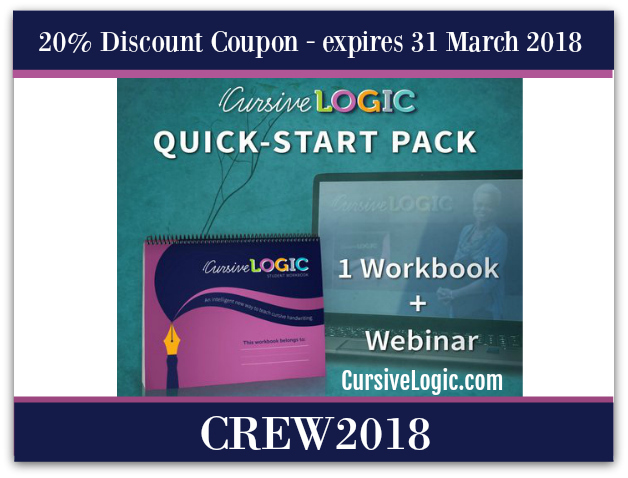 This pack includes one CursiveLogic workbook, and access to an instructional webinar that explains the patent-pending CursiveLogic method step by step. This is all you need, along with pencils, colored pencils and/or colored markers. We were given this set by CursiveLogic, along with the following. We were also blessed with the gift for the purpose of this review a copy of The Art of Cursive. First, let’s talk about The CursiveLogic Quick Start Pack. This book is top spiral bound, which makes it nice for both the right or left-handed student. This is nice, as it means never having to rest the arm on the spiral. The covers are heavy, and glossy, which I find attractive. The book is arranged so that you go all the way to the end with lower case letters, then flip to the back side and go through again, for the capital letters. It is intended to go for ten weeks, however we are taking it much slower so that “The Puzzler” doesn’t give up. As I said in the beginning, “The Puzzler” was resistant to the teaching and learning method. 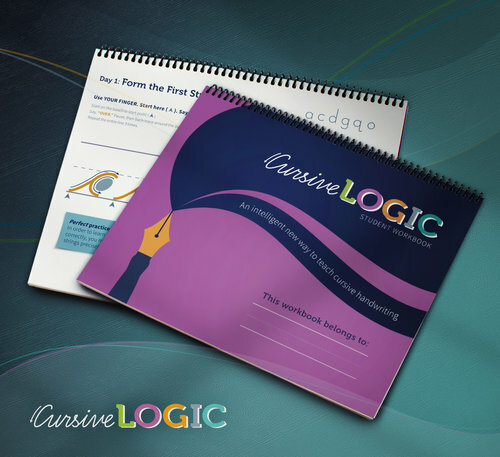 CursiveLogic was founded by Linda Shrewsbury, who was volunteering in a local literacy program. She was a reading tutor to Josh, who was age 23 and had learning disabilities. He wanted to learn cursive so as to be able to sign his name. Read more about how this caused Linda to develop the CursiveLogic concept here. Here is Linda to explain to you about how this came about . . .
As you heard from Linda, the alphabet is actually made up of four distinct shape as their base. Wit each letter, the student is given a color and a catch phrase to help in learning the system of writing. All of this is explained thoroughly in the accompanying webinar. The webinar is 48 minutes long, and although i was mentally prepared to just sit and be bored, I actually did get quite a bit out of it. The instructions really do help, if you would like to have extra aid in understanding how to properly take the book and teach your child what to do. The student will first print the alphabet in the beginning of the workbook. “The Puzzler” next was instructed to find the letters which begin with the first basic shape, “orange oval” and then color in the boxes with orange. He used a colored pencil for this. He will then trace over the letters with his finger while repeating the catch phrase which goes with that letter. This helps with muscle memory, audio, speech, etc. “The Puzzler” objected strenuously to doing this, and kept saying “Do I HAVE to keep saying the verse?” It was only after I MADE him say it over and over when writing for himself (instead of tracing) that he did admit to being able to remember easier how to do this. “The Puzzler” is diagnosed with OCD, so this is taking a LOT longer that suggested. This is because he gets extremely upset if it is not absolutely perfect. But, the picture above is from lesson one! And he has never done cursive before at all, and right after doing this page. he looked ahead and was able to read every single word that was based on “orange oval” letters. He is really looking forward to seeing how well he will be doing by the end of this program! Now, about The Art of Cursive. I was so excited to see this book being included for our review! It is an adult coloring book, but “The Puzzler” is the colorist in our family, with quite a stash of adult coloring books to his name. He even asked for them, along with coloring pencils, for Christmas. This is not your usual adult coloring book at all. 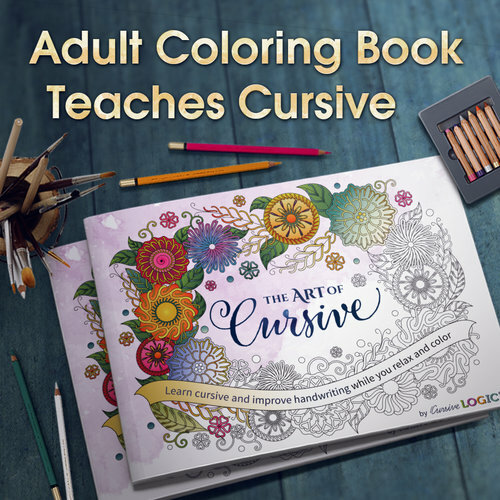 Although it is not meant as a cursive instruction book, with four brief lessons to refresh the adult who may wish to improve handwriting. After that, there are twenty-seven gorgeous images to color. Oh, but as I said, not your usual coloring pages! They are printed on very nice, heavy paper. The pictures incorporate the letter shapes in strings, along with a lovely quote, and on the backside of the page is the quote to copy using the CursiveLogic method. Here is a page that “The Puzzler” is currently working on . . . He chose to do the quote in one color, then not use that color again so that the quote would stand out. “The Puzzler” is enjoying himself with this one, and is very proud of being able to finally manage cursive lessons. He also loves, loves, loves The Art of Cursive. 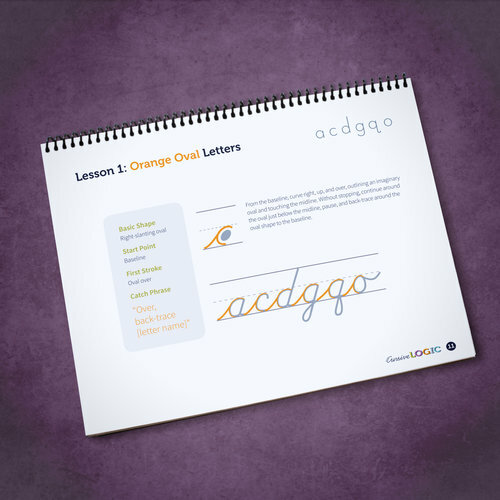 We very much recommend this program to you, especially if you have a learning disabled child, one who has been resistant to other cursive curricula, or you yourself would like to have nicer writing! As a special gift to you, my readers, here is a special code for a 20% discount, which will be good until the end of March. Just click this banner for a direct link! To read 99 other fair and honest reviews from my fellow crew members, please click the banner below . . . This is wonderful! I remember really struggling in third grade to learn cursive. I also remember the teacher taking the pen out of my hand because I held it incorrectly. She kept repositioning the pen in my hand and, as she did, my handwriting continued to get worse. After third grade, no one seemed to care that I held my pen incorrectly and my handwriting improved dramatically. If I had learned this technique, I would have been much happier about cursive.